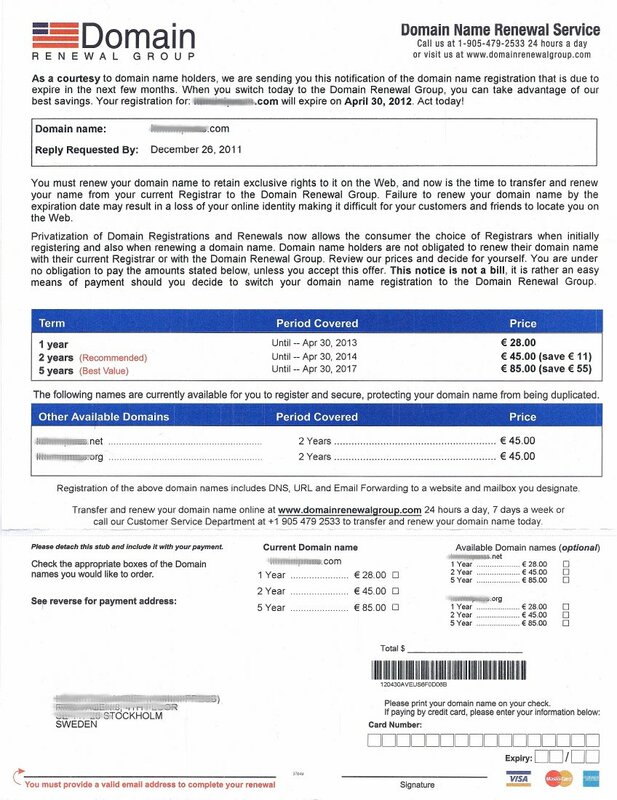 … if you read more carefully, you will notice they are actually proposing to transfer the registration of your domain to them. And for a relatively steep price at that. If you decide to pay this service, you will soon receive a request from your current website hosting provider to confirm the transfer. And because hosting usually includes domain name registration, you will start paying double from that point on. So do not reply to this bill. Or send the return envelope back empty without postage. If you have already replied, I’m afraid you lost your money. Unless you can notify your credit card company in time. It would really surprise me if you would get a refund from the Domain Renewal Group. As far as I can tell, the company has been sued for malpractice before but apparently they cannot be forced to stop with these deceptive practices.